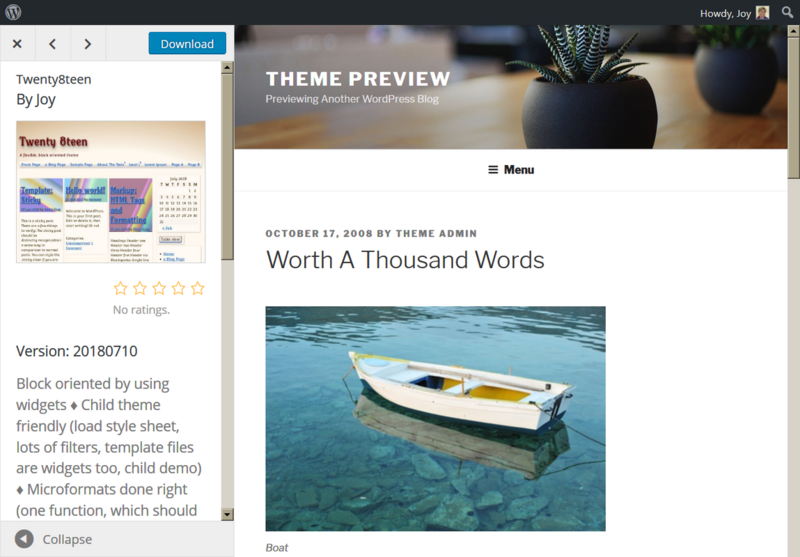 The preview works by setting a cookie in your browser telling the site what theme you're previewing. When you load a different theme, then the cookies changes and now you're using another theme. Cookies go across your tabs. I understand the current limitation, but the inability to preview two themes side by side seems counter-intuitive, especially when the core customizer already supports that. Instead of relying just on the cookie initially set, can we pass the theme slug via an AJAX request when clicking on any link in the iframe, like the customizer does? Fwiw, this bug still exists with the new theme directory (not surprising) but now it shows Twenty Fifteen instead of showing the theme in tab 2. The previewer has not changed in how it operates under the hood. In redoing the preview data, I'll also look at this and see if a better method can be devised. #2943 was marked as a duplicate. This is not just about seeing two themes at once, or as in #2943 saying it's Safari or as in #145 saying it's old IE. I am using latest Firefox, and I get the default theme in the preview when clicking a link, whether I'm on the .org Theme page or in the admin Add New theme page. It could be something to do with the browser blocking 3rd party cookies. @joyously That seems to have been a new behaviour and not related to this old ticket. The cookie values have been ignored for the last ~4 weeks causing all clicks to switch back to the current default theme. That's now been fixed (dotorg14318 for those with access). Due to how it's currently working - using cookies, the original report of not being able to preview two themes at the same time is still valid and will require a rearchitecture of the previewer. That's unfortunately a low-priority at present. I think I've worked out a simpler solution by adjusting the type of URLs we use in the previewer. Then we don't need the cookie anymore. Some adjustment of rewrites might be needed, but seems like it should work for any theme. PHP combines the GET parameters from the URL and the nginx rules and it was seemingly working fine. I don't understand the alloptions stuff, as far as I can see it's not even needed, so after stripping that all out i stopped there to avoid breaking something before figuring out what it was trying to do. The alloptions stuff is there to set the values correctly in the global alloptions values, so as to be the same as those in the theme object. It's not strictly necessary, but having it different than what is in the theme object caused undesirable behavior for some themes. I'll do some tests with the home filtering, see if I can find any anomalies.